Trash spilled from a Philadelphia garbage truck lies on North Bucknell Street in the city's Fairmount neighborhood. Philadelphia Mayor Jim Kenney is expected to announce a street sweeping pilot program sometime in early 2019. 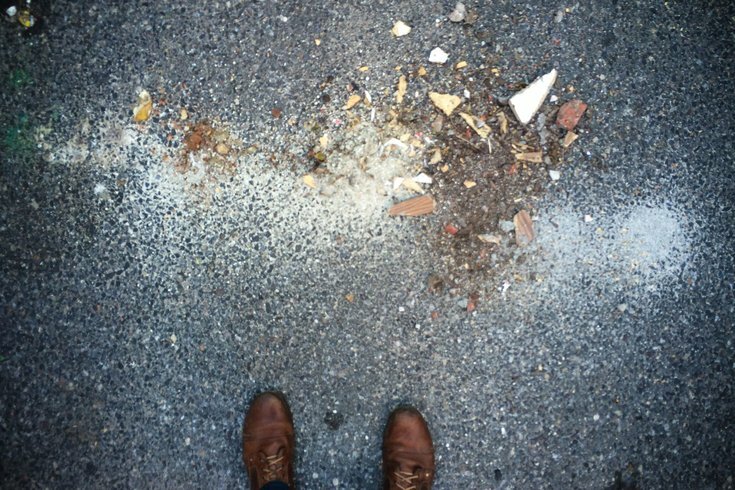 Nic Esposito, director of the Zero Waste and Litter Cabinet, told WHYY on Wednesday the city is looking at a “possible pilot program, hopefully in the spring,” a statement which leaves plenty of wiggle room for the start date. Esposito said an official announcement would come from Kenney. Esposito also said the the city hasn’t selected a “target area” for the pilot, which probably means street sweeping still wouldn't be citywide in the spring. It’s certainly progress. As Billy Penn pointed out in September, Philadelphia is the only major city in the country without consistent, scheduled street sweeping. Why are we making street sweeping complicated? In late November, Kenney told WHYY the city was looking at “some form” of street cleaning, but city politicians were still apprehensive.